A pair of weeks ago here on the blog of Hotel Angela we told you about a superb photography exhibition here in Fuengirola. Today our blog is about art again as right now there is a very interesting exhibition in CAC Mijas. 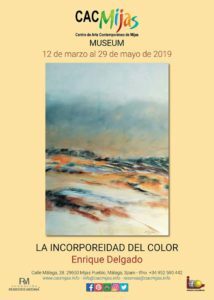 It is called “La incorporeidad del Color” ( “The nonphysicality of colour”), it includes paintings by artist Enrique Delgado and can get visited until Wednesday, the 29th of May. The museum is in the centre of Mijas Pueblo, in calle Malaga, and it is open Monday to Saturday from 10 P.M to 6 P.M. If you love art, Hotel Angela, your hotel in Fuengirola, recommends you not to miss the opportunity to visit this beautiful contemporary art centre. 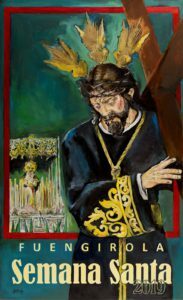 If you have the fortune of being on holiday at Hotel Angela right now, we recommend you not to miss one of the most impressive Holy Week representations in Costa del Sol! This week, on the blog of Hotel Angela, your hotel en Fuengirola, we would like to recommend you another great free photography exhibition.